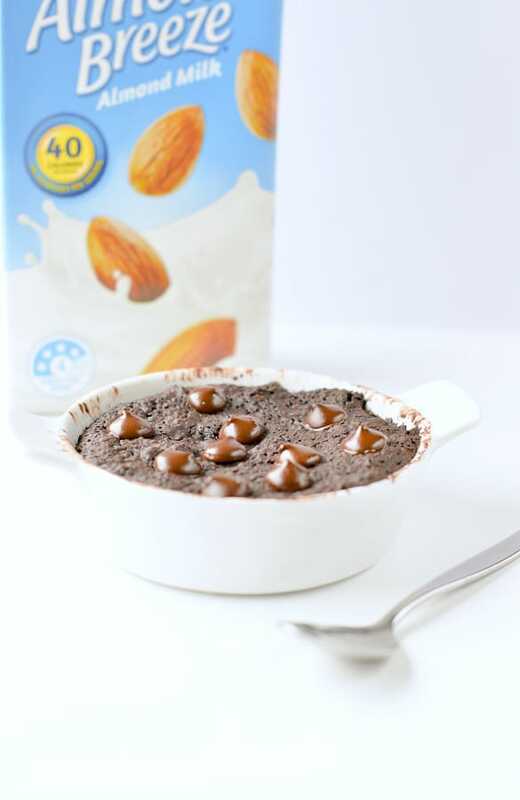 Healthy mug brownie a low calories easy sugar free vegan mug brownie ready in less than 5 minutes. 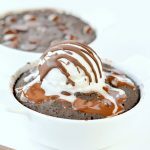 This single serve dairy free mug brownie made with unsweetened cocoa powder and almond milk is the perfect sugar free dessert to fix your sugar craving in less than 5 minutes with only few calories. Oat flour – it is easy to make your own! Ground rolled oats or jumbo oats in your grinder or blender until a thin powder form. Oat flour is a very healthy flour made of 11 % fiber, your gut will thank you for that ! 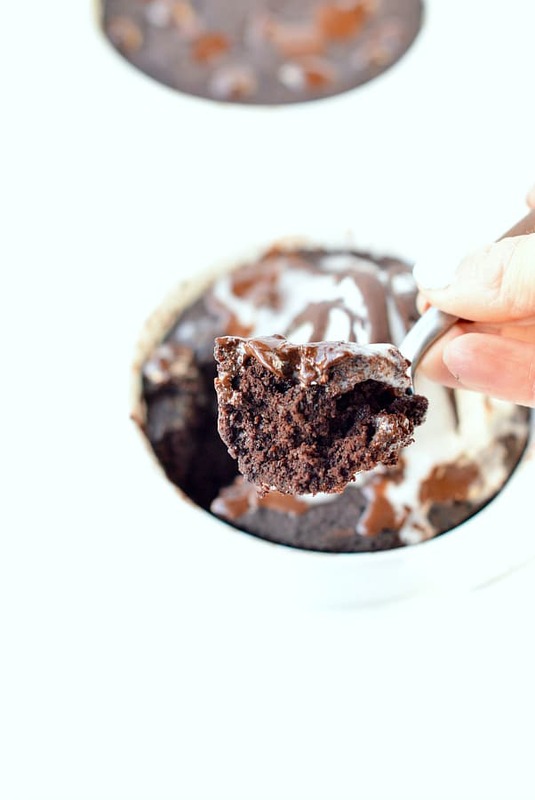 It is not as low carb as almond flour or coconut flour – if you prefer a low carb chocolate mug recipe try my low carb chocolate mug cake here – BUT it is a really healthy medium carb flour alternative to enjoy a sugar free dessert safely. Unsweetened Almond Breeze Almond Milk – that is my favorite dairy free milk, it is lactose free, low calorie and no sugar added! Sugar free chocolate chips – this is optional but it adds a lovely melted chocolate texture on top of your healthy mug brownie. I am using stevia sweetened chocolate chips. Baking powder – it gives a little raise to the brownie, don’t skip it ! Vegetable oil – feel free to use what you have got on hands! I love melted coconut oil. Use a microwave safe mug or ramekin. Don’t use silicon or plastic. 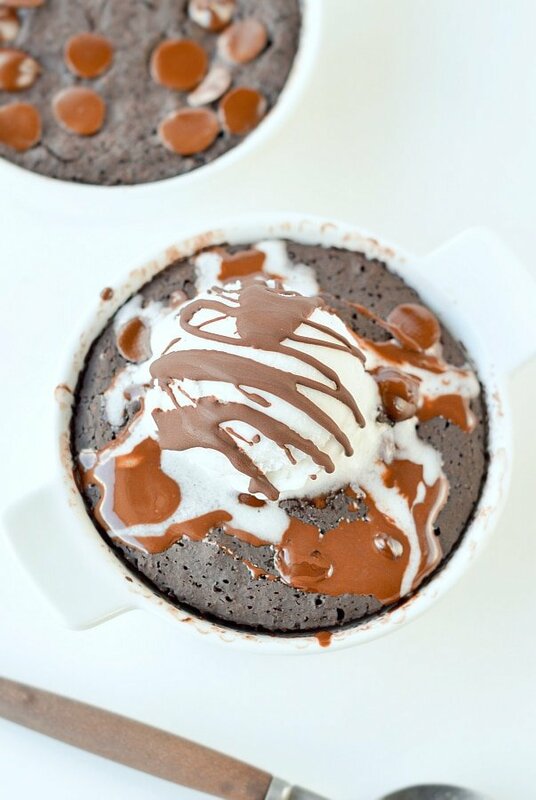 How to serve your healthy mug brownie? I recommend you to cool down at least 3-5 minutes before eating your mug brownie. It will very hot when out of the microwave and this prevent burning yourself. I love to serve mine with an extra scoop of coconut cream ice cream and a drizzle of melted sugar free chocolate. 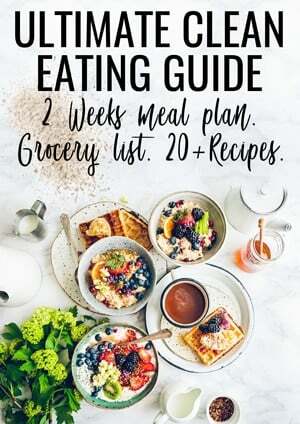 Well, that extra will go over the base calories but sometimes it does not matter right? Watch the healthy mug brownie recipe video and make it now ! Enjoy the healthy mug brownie! 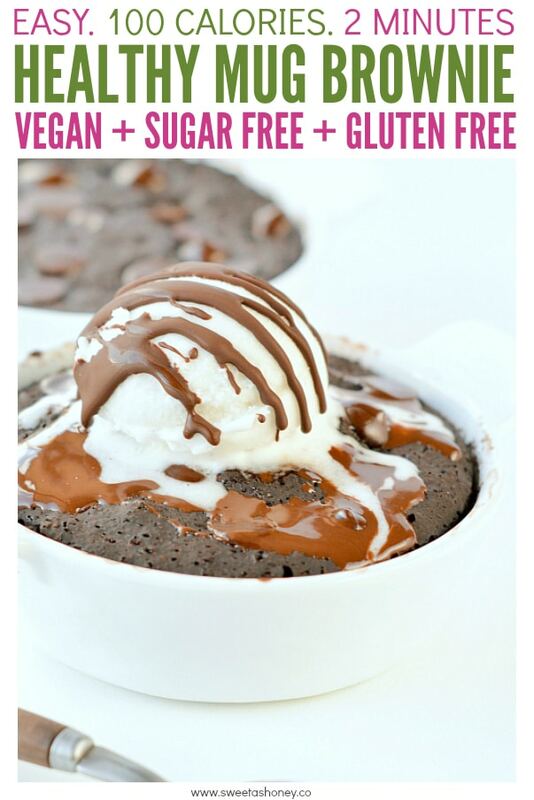 Healthy mug brownie few calories easy sugar free + vegan mug brownie. A single serve dairy free mug brownie with unsweetened cocoa powder and almond milk. The perfect family snack for movie night. 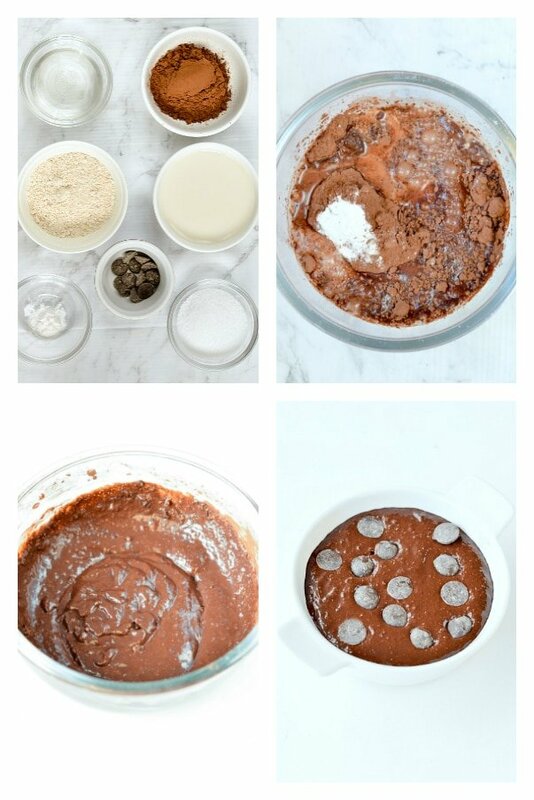 In a small bowl or directly in your mug add all the ingredients except the chocolate chips - if used. Combine with a fork or a small whisk until the batter is consistent and shiny. Sprinkle extra chocolate chips on top if you like. I used stevia sweetened dark chocolate chips. Microwave on high for 1 minutes - 1 minute 20 s. Depending on your microwave and taste bud you may want the extra 20 seconds. First go for 1 minute, check and see. Mine is still a little bit on runny on the border after 1 minute but I actually like it this way as well. Play with the cooking time to create different cake texture! Low Carb/grain free option: you can adapt the recipe to make it grain free and low carb. Simply swap the oat flour for 2 tablespoons of almond meal + 1 tablespoon of coconut flour and add 1 extra tablespoon of cocoa powder. The texture will be different, slightly more moist but delicious as well. Nutrition panel is for one healthy mug brownie. 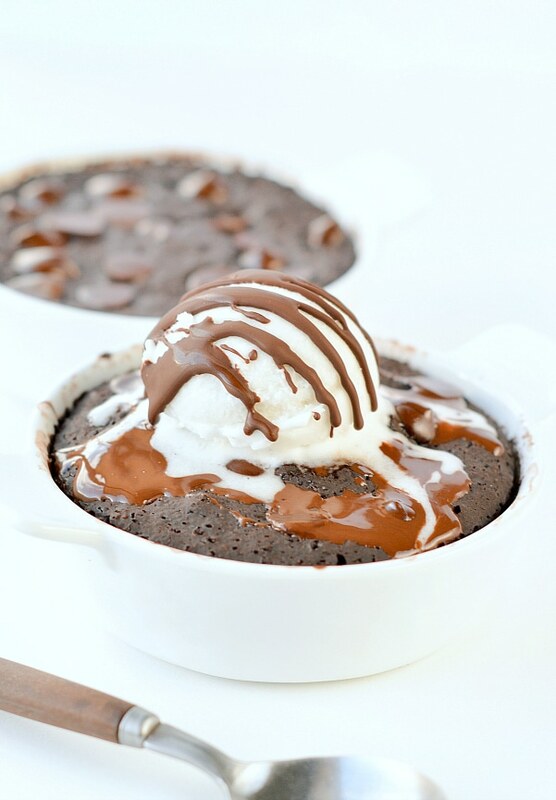 This recipe serve one healthy mug brownie.